GLAAD honored California Lieutenant Governor Gavin Newsom, Grammy-nominated singer Adam Lambert, and the best in entertainment and journalism on Saturday night at the 24th Annual GLAAD Media Awards in San Francisco. Mel B, Guillermo Diaz, Tamala Jones, Jinkx Monsoon, Rex Lee and Laverne Cox were among the special guests. The GLAAD Media Awards recognize and honor media for their fair, accurate and inclusive representations of the lesbian, gay, bisexual and transgender (LGBT) community and the issues that affect their lives. The GLAAD Media Awards also fund GLAAD's work to amplify stories of LGBT people and issues that build support for equality. At the ceremony, filmmaker Jennifer Siebel Newsom presented GLAAD's Golden Gate Award to her husband, Gavin Newsom. In accepting the award, Newsom said, "There's one fundamental that defines the best of this city, and the best of this organization, and that is we don’t tolerate our diversity, we truly celebrate our diversity. We highlight all those wonderful and interesting differences, but at the end of the day we unite around our common humanity. As Dr. King so eloquently said, 'We are all bound together by a web of mutuality.' We're all in this together." Melanie Brown, a judge on America's Got Talent and former Spice Girl, presented GLAAD's Davidson/Valentini Award to out singer Adam Lambert. Speaking of the challenges associated with being an out entertainer, Lambert said, "We are right in the middle of two generations with two different perspectives but one common thread - love. With all the differences of opinion both within the LGBT community and elsewhere, the best we can do is to keep it real and to spread a message of acceptance. If we can inspire even one person to open their mind, or another to be who they want to be, whether they're gay or straight, old or young, man or woman, black or white – then it's worth being objectified by the sometimes frustrating world of media sensationalism." 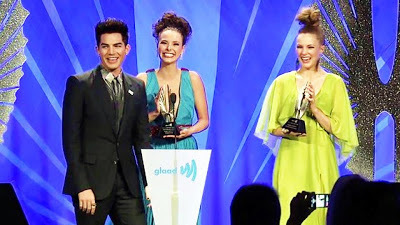 Lambert continued, "Thank you to GLAAD for recognizing my efforts, because I put a lot of effort into this. I think about it a lot (it makes me crazy), but my goal is to try to represent both myself and my community proudly." The reigning World Series champion San Francisco Giants received the Corporate Leader Award. The Giants are the first professional sports team honored by GLAAD. They were the first ever professional sports team to host an HIV/AIDS benefit game in 1994, and have generated more than $1.3 million for Bay Area HIV/AIDS education. The Giants were also the first major league sports team to record a video for the It Gets Better project, and this month will hold their 11th Annual LGBT Night Out. Travis Fine, the writer/director of Any Day Now, accepted the award for Outstanding Film - Limited Release. Writer and artist Dan Parent accepted the award for Outstanding Comic Book for the ongoing comic book series Kevin Keller. Journalist Marc Lamont Hill accepted the award for Outstanding Digital Journalism Article for his piece "Why Aren't We Fighting for CeCe McDonald?" which appeared on Ebony.com. RuPaul's Drag Race winner Jinkx Monsoon performed for the capacity crowd. Guests included: Tamala Jones (Castle); Guillermo Diaz (Scandal); Jessica Clark (True Blood); Rex Lee (Suburgatory); Teri Polo, Sherri Saum, Peter Paige (The Fosters); Jaymes Vaughn, James Davis (The Amazing Race); Kyle Richards (The Real Housewives of Beverly Hills); Jennifer Biesty, Ryan Scott, Josie Smith-Malave (Top Chef); Laverne Cox, E.J. Bonilla (Musical Chairs); Travis Fine, Isaac Leyva (Any Day Now); Dan Parent (writer, artist Kevin Keller); Marc Lamont Hill (HuffPost Live); Prop 8 plaintiffs Jeff Zarrillo, Paul Katami, Kris Perry, Sandra Stier; LGBT advocates Karen and Eric Andresen, Shane Bitney Crone, Jennifer Tyrrell and Dr. Kortney Ryan Ziegler; former Pittsburgh Pirates owner Kevin McClatchy; number one WNBA draft pick Brittney Griner; GLAAD National Spokespersons Wilson Cruz and Omar Sharif, Jr. Following is a complete list of GLAAD Media Award recipients announced Saturday in San Francisco. Additional awards were presented in New York on March 16 and in Los Angeles on April 20. Additional awards were presented in New York on March 16 and in Los Angeles on April 20. The GLAAD Media Awards recognize and honor media for their fair, accurate and inclusive representations of the lesbian, gay, bisexual and transgender community and the issues that affect their lives. The GLAAD Media Awards also fund GLAAD's work to amplify stories of LGBT people and issues that build support for equality. GLAAD Media Award nominees were published, released or broadcast between January 1, 2012 and December 31, 2012. About GLAAD: GLAAD amplifies the voice of the LGBT community by empowering real people to share their stories, holding the media accountable for the words and images they present, and helping grassroots organizations communicate effectively. By ensuring that the stories of LGBT people are heard through the media, GLAAD promotes understanding, increases acceptance, and advances equality. For more information, please visit www.glaad.org or connect with GLAAD on Facebook andTwitter.